I know Bellows Falls pretty well and plan on modelling it one day. These mirrored pictures are doing my head in I look forward to seeing the final results! garethashenden wrote: I know Bellows Falls pretty well and plan on modelling it one day. These mirrored pictures are doing my head in I look forward to seeing the final results! It is kind of disturbing, isn't it! Armchair Modeller wrote: Wow, Rob. We are really getting into deep water here! I will resist the temptation to show you all my scenic ideas for Neversay for the time being, but here is the general idea for the right hand end (as viewed by the public), including the overlap onto the fiddle yard board. Note the view blocker, which should help the scenery to disappear into the backscene so much more easily. Let me guess - the hotel is going to be rather decrepit, having seen better days, with a broken window or two? Absolutely not. I know it has been up north quite a lot. Armchair Modeller wrote: A photo would very much help me understand the concept. Photos online only show the scenic bits. I will ask Robin for some pix. PM me with your email address so he can send direct to you. Many thanks for the offer of photos. I am really grateful. I will PM you, as requested. It would be nice if Robin would allow us to post them here though, as I am sure they would be of interest to others. I will leave that to you and Robin's wishes. I have contacted Robin who says no photos exist yet but he will make some and is happy for them to go public here. He has a full time job so won't be super-quick in supplying them....watch this space. Its a long road before I get to model it though. Many other things to do first. Last edited by Armchair Modeller on Fri Nov 11, 2016 10:38 am, edited 1 time in total. Paul Townsend wrote: I have contacted Robin who says no photos exist yet but he will make some and is happy for them to go public here. Many thanks, Paul. I am sure we shall all find the photos very interesting and useful. I am very happy to wait though, as there are many other things I can be getting on with in the meantime. 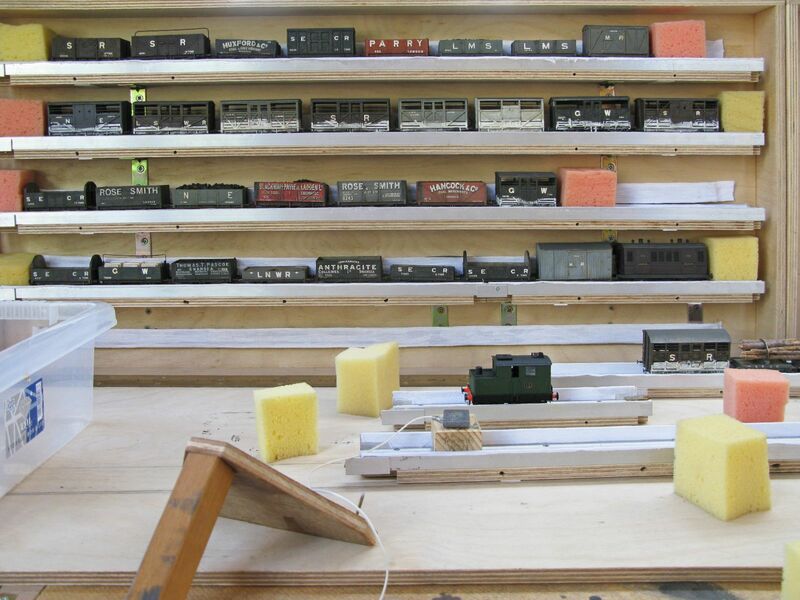 I have found a photo of Robin's fiddle yard on our own website - the Retrospective for Scalefour Southwest 2013. More photos of the overall setup and of the detail would nevertheless be appreciated - but not if it will be a lot of hassle, of course. This seems to be very much the kind of thing I wish to build for myself. It looks as if Robin has smaller add-on cassettes to add or remove locos to/from rolling stock. I found a good supply of 15mm aluminium angle on eBay, which arrived today. I also found some old 20mm chipboard in the garage that can be used for the bases of the cassettes. It was used to temporarily seal a window when burglars smashed their way into my kitchen a few years ago. Technically it was free, as the window company supplied and fitted it. Nice to find a use for it after all this time. The longest cassettes will be 750mm long, with some shorter ones for tiny trains like railcars. 750mm is comfortably longer than the loop at the terminus, so will be more than adequate for my purposes. Armchair Modeller wrote: I have found a photo of Robin's fiddle yard on our own website - the Retrospective for Scalefour Southwest 2013. Ah well, Robin didn't take the retro pix...that would be the official photographer which explains why he didn't know of it....although I think Robin is a S4 member he doesnt come on this forum. 1. The rack lid hinges down and is removed in operating mode by sliding sideways, not as floor of FY as I said before. This is achieved by cunning hinges that are often used on light cupboard doors. 2. In the foreground the wood thingy has a handle attached to a triangle at right angles equipped with 2 long fat nails. There are two these and we use them to remove cassettes from the rack down to the FY floor. As long as you put the sponges in the ends, stock won't fall out. 3. There are various cassettes of differing length and at close down Robin ensures particular batches of stock are grouped to fit. Likewise for the loco cassettes in their similar smaller rack/case. 4. When the two racks are stood up as illustrated in operating mode they are prevented form falling forward by pairs of similar long nails that are mounted horizontally in the FY frame and locate into holes in the rack framework. Its very stable in practice. 5. The team are required to maintain the stock boxes vertical when carried and stowed in the van etc so handles are only on the top. Transgressors get a smacking! 6. The edge pieces must be dimensioned carefully so that the interior of the rack has just enough depth to accomodate stock plus cloth packing pieces which are glued in place and give a little resilience against someone failing to observe point 5. This cloth is slightly special as it is squashy but has no loose threads that catch door handles etc. Doubtless Robin will tell us its source. Many thanks Paul. Those comments and observations are very useful. I am likely to have a few problems with the potentially huge variation in stock width on my layout - anything from around 6ft 6in to 10ft 6in. Otherwise, I think I could use Robin's ideas more or less as is. Armchair Modeller wrote: I am likely to have a few problems with the potentially huge variation in stock width on my layout - anything from around 6ft 6in to 10ft 6in. Otherwise, I think I could use Robin's ideas more or less as is. You still could if you made 3 boxes with cassettes 1 metre (plus a bit) long and split your trains. I presume your fiddle yard will have to be 3m or so if your trains are going to be that long. Sorry, I may not have made myself clear, David. The 6ft 6in and 10ft 6in I quoted refer to the width (full size) of the potential stock (i.e. 26mm to 42mm in 4mm scale) on my layout, not the cassette length. I do apologise. No, I missed the word 'width'. I should apologise. This won't matter when rack is in use , operational mode. It IS an issue for transport. I guess the widest stock would be carriages. If trains were organised according to batches of similar width for transport mode then varying the soft packing thickness on specific shelf positions would work. If a mixed width train is required to travel in the box it is still viable if the train is marshalled in a predictable order so packing matches the stock position. Of course this does complicate things and makes the transition from ops mode to travel mode trickier but its worth thinking the options through. In my book anything to minimise stock handling is good! The problem for me in the long term will be the mix of narrow, tramway-style stock, converted road vehicles and main line stuff. Thinking about it though, most of the stock at the extremes will probably be short, self contained vehicles like railcars, which can be stored separately. How does Robin store his locos for transit? I assume the big cabinet is for rolling stock only? In the short term, of course, I won't have much of a problem as I won't have much stock. Much Murkle has a nice cassette system too - worth a look here if anyone is interested. Armchair Modeller wrote: How does Robin store his locos for transit? I assume the big cabinet is for rolling stock only? He has another shorter box of similar design just for locos. This makes it easy at an exhibition to take valuable locos from layout to digs overnight. Here are some words from Robin about his stock boxes for Rolvenden. He also refers to a slightly modified version for his new layout Wantage which is starting to appear on the Exhibition circuit. Robin has taken some more pix but they are currently stuck in his camera. I will try and help extract them on Tuesday evening and forward them here. "Hi Paul, I have taken some photos but now I cant get my camera to down load to the computer. So here are a few dimensions at least for you to go on with. I used 9mm plywood sheet, on the Rolvenden in "Model Rail" Boxes I used birch but on the larger Wantage box I have used Far Eastern Ply and it is much lighter. The exterior depth is 60mm giving an internal depth of 51mm. The front folds down on piano hinges to form the base for assembling the trains. Large stock box is 382mm high X 818mm long. The large cassettes are 770mm long with a width of 43mm. The aluminum angle is 12mm this does have a tendency to very from batch to batch so I suggest you buy it all at the same time and check they are the same. ( I may have picked up some half inch at a later date though I used the same suppler and took it from the same shelve. The internal packing I use in the box to prevent movement is self adhesive foam door drought excluder. This I have put into the back of the box around solebar/waist height, I found 7m was right for modern stock including all RCH standard goods wagons but on many earlier and pre grouping wagons and locos I found them to be a bit narrower so I added an extra 3mm to the area these go in the box to hold them safe. On packing up as well as the sponges at the ends of the cassettes and the foam behind I introduce a 1/8" sheet of hard board (this being a close fit inside the box) to the front of the cassettes this also has foam drought excluder on it the corresponds to the foam in the back of the box, this is then sandwiched between the closing door and the cassettes to hold every thing safe for traveling. The cassettes are stacked in the box on to 11/2" steel 90d brackets that are screwed into the back sheet with 3/8" No6 C/S wood screws. I pre drill their holes with a 1.5mm drill to a depth of about 8mm, I then screw them home but not fully to cut the thread in the ply then I grind off about 1.5 mm and screw them in tight this prevents any sharp points sticking out of the back. You cant file modern screws as they are hardened. 1/4" screws are just too short, if they made a 5/16" screw it would have probably been just right. The best photo I know of that shows the stock boxes was published in the article on Rolvenden in Model Rail No209 June 2015. If I can of any more help please let me know Robin." Many thanks Paul. I would appreciate it very much if you could pass on my thanks to Robin also. I seem to be waiting for lots of parts for various projects at the moment, including a couple of orders from Ultrascale which are still months and months away. Progress on railcars and other stock has more or less stalled completely - though hopefully not for very long, for the most part. Thoughts have instead turned to the second scenic board. I have track to build, including the potentially difficult 3-way turnout - plus the turntable to finish and install. One little electrical bit I have now done on all 3 boards is to install the Phono sockets for the DCC power. This is a repeat of the method I used for Neversay 1. These will be used for connecting the DCC circuit between boards and to plug in my NCE system to any baseboard individually - or to any layout without having to buy lots of Connection Panels. At the last but one local 2mm meeting, a fellow modeller came along with almost the identical idea on his layout - but using a converted plastic toolbox to house the transformer. The previously loose piece of baseboard top at the turntable end has now been fixed to the baseboard. I attached some wooden spacers underneath before this. The turntable base, complete with turntable will be attached from the underside, all being well (sorry for the slight pun there ). The last time I discussed the turntable area, I was considering whether or not to add a small roundhouse at the back of the turntable. The more I think about it, the better it sounds. I think we can take it for granted that the roundhouse will be there (eventually!). I will also make provision for the through track to the dockside (freight only). This can disappear through a gateway, which would act as a scenic break until I pluck up the courage to build another baseboard. I have added some baseboard joiners to the baseboard end, anyway. In reality, I don't think the dock scene is on the cards until I have finished the first two scenic boards. A minimalistic cassette system would work OK in the meantime though. For the London Road Models turntable itself, I am substituting a brass tube for the brass pivot rod supplied. This will make it easier to get wiring up from the baseboard to the running rails. I have ordered a slip ring which will be fitted at the base of the pivot to allow the wiring to pivot with the turntable. I am thinking of using a Frog Juicer or similar to automatically reverse the current on the turntable. I hope this setup will give nice, clean DCC power to the turntable rails - rather than relying on picking up current through the circular pit rail or using a home-made commutator arrangement under the baseboard. I will be modelling the turntable as if it had been moved from an earlier site, probably during WW1. The turntable well will therefore be relatively modern, in concrete. Although I bought the well kit from LRM, I will probably only use the curved rail component. I think it would be easier for me to scratch-build the rest of the well. I have found a few nice photos on the Web to base the general shape and the weathering on. I can get on quite a long way with this before the slip ring turns up from China. Last edited by Armchair Modeller on Tue Nov 15, 2016 9:59 am, edited 1 time in total. The dcc connector you show is a "phono" not "Din"
Sorry Paul. Many thanks for your correction. I shouldn't post things so late in the evening! This pretty much the text-book version of the system described by Chris Pendlenton in MRJ 27 'Variations for Fiddle'	p.339 He also advocates strips of foam draught-proofer applied along the inside of the box and lid at solebar level to hold the stock in position when the box is closed. Works a treat! Ah, I had forgotten about that article. Many thanks for reminding me. I will dig it out this evening and have a read.